NETWORK UPDATE The 1st episode of SELFIE, ABOUT A BOY and both NBC and ABC’s Election Coverage lost 0.1 in final numbers, as did the SUPERNATURAL clip show. SONS OF ANARCHY (FX) dominated Tuesday cable, even down 0.09 to 1.89–in fact, with the exception of THE VOICE, it topped everything on network TV. The night’s ANARCHY AFTERWORD post-show scored a 0.87. 19 KIDS AND COUNTING (TLC) lost a hefty 0.29 from last week’s episode to 1.21. Considering the election results, it’s not a surprise that Fox News owned the night’s political viewers, with 6 of the top 14 slots, peaking at 10PM Eastern time at 1.10. Comedy Central’s live DAILY SHOW/COLBERT REPORT hour was next with election “results,” at 0.68/0.63, although both were below the 0.77 (up 0.01 from last week) for TOSH.0. TOSH was followed by BRICKLEBERRY, up a tick at 0.49. CNN peaked at 0.63, while MSNBC, with its largely Democratic appeal, didn’t get higher than 0.34. History’s CURSE OF OAK ISLAND was at 0.89, and INK MASTER (Spike) held at 0.76. On USA, CHRISLEY KNOWS BEST was up a tenth to 0.63, while BENCHED inched up 0.01 to 0.40. IF LOVING YOU IS WRONG (OWN) gained 0.08 to 0.53. REAL HUSBANDS (BET) rose 0.07 to 0.44. 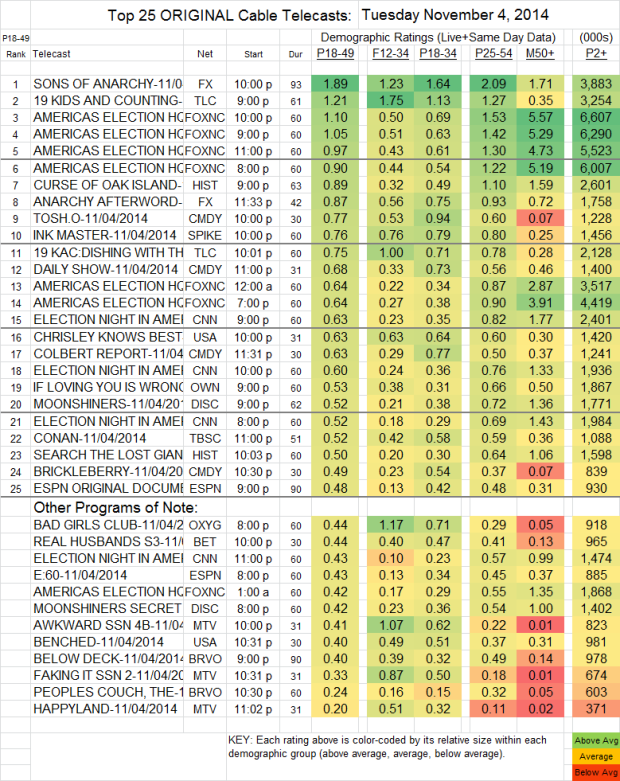 On MTV, AWKWARD lost 0.02 to 0.41, FAKING IT was down the same margin to 0.33 0.36, and HAPPYLAND was steady at 0.20.